I would quite happily live in pyjamas if I could, especially with there being so many cute, snuggly and pretty ones available. For my birthday I got a lovely pair of Purple fleecy pyjamas from Primark and this week I’ve not felt too well, so have been snuggling up in them at every opportunity. I did pop to Marks and Spencer with my Mum a few days ago and I was really excited to see all their wintery/Christmas selection. 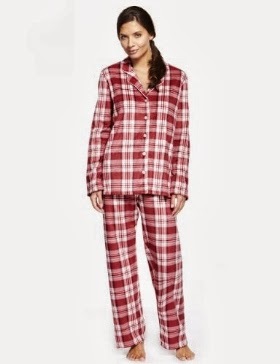 I’ve got my eye on a few pairs of pyjamas, as I’d like to get myself a new pair to wear on Christmas Eve. If you’re a pyjama fiend like me, I’d recommend checking out M&S and Primark. I’d love to hear of any other places selling nice pyjamas from you! I know this song has been out for a while, but I just can’t get enough of it! I’d never heard of Macklemore before this, but have since listened to a few more of their songs and I really like their style of music. I particularly like the chorus by Mary Lambert. I’m a self-confessed soap addict and I’m not ashamed to admit it! Hollyoaks, Emmerdale, Corrie and Eastenders – I watch them all. But this week has been particularly epic, both in the Hollyoaks and Emmerdale villages and on the Coronation Street cobbles. In Hollyoaks there was a massive explosion in the council houses, with fatal consequences. I must admit I shed a little tear when Dennis had to explain to Leanne that she was going to die. Emmerdale brought us some edge-of-your-seat drama when killer Cameron escaped from prison and came back to the village to find Debbie and seek revenge. It resulted in him holding half the village hostage in the Woolpack, leaving Alesha fighting for her life in hospital and a watery struggle involving Cameron, Debbie, Chas and Marlon, with one of them not making it out alive. And lastly in Corrie it was Lily Platt’s Christening and the secrets of a DNA test and the extent of David’s anger at his brother were revealed. This week also continued to follow Roy and Hayley’s touching story, after Hayley’s cancer diagnosis, as they had a day out in Blackpool. I know a lot of the time these soaps are pretty far-fetched, but I find them such a good distraction if I’m not feeling great. Pyjamas are the best! I feel the need to buy some new ones this year, I'm thinking a Primark spree is needed!